I have been on my own little risotto kick. The buttery noodles make the perfect base for any additions. I recently posted a mushroom risotto skillet and it was a hit so I wanted to bring another simple risotto dish that can all be made with little clean up. Shrimp cooks faster than just about anything else. It may be a little more expensive that chicken breast or chuck beef but it’s certainly worth the little splurge. This is a perfect dish for when you have friends coming over and you want something simple but a little more formal. There’s lots of garlic, butter j cheese so how in the world could you go wrong. I used shrimp that was not deveined or cleaned but like I always say, go ahead and buy the shrimp that is all ready to go if you don’t want to hassle with the shrimp. There is absolutely nothing wrong with taking short cuts in this recipe to make it that much easier. You’ll need about a pound so you can include whatever kind you want. 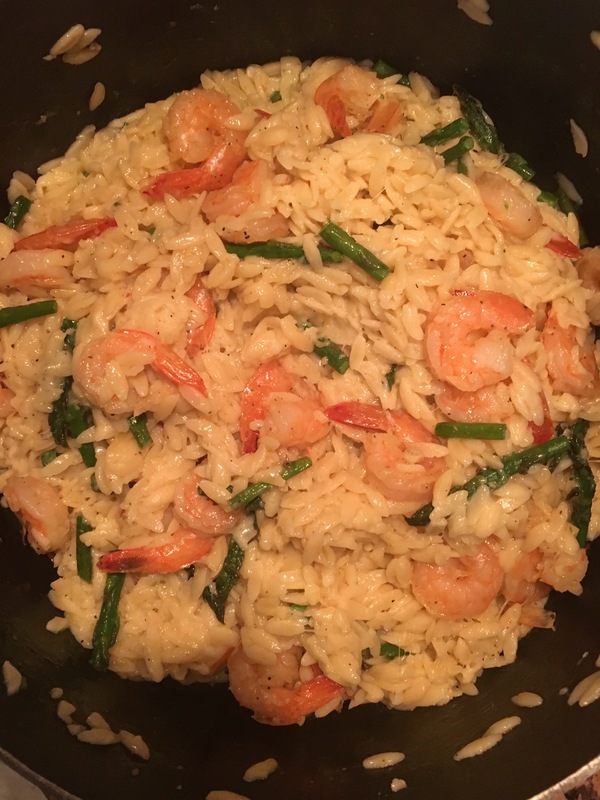 I used large shrimp because they do shrink when they cook but grab whatever is on sale! In a deep skillet, add 4 tbsp of your butter. 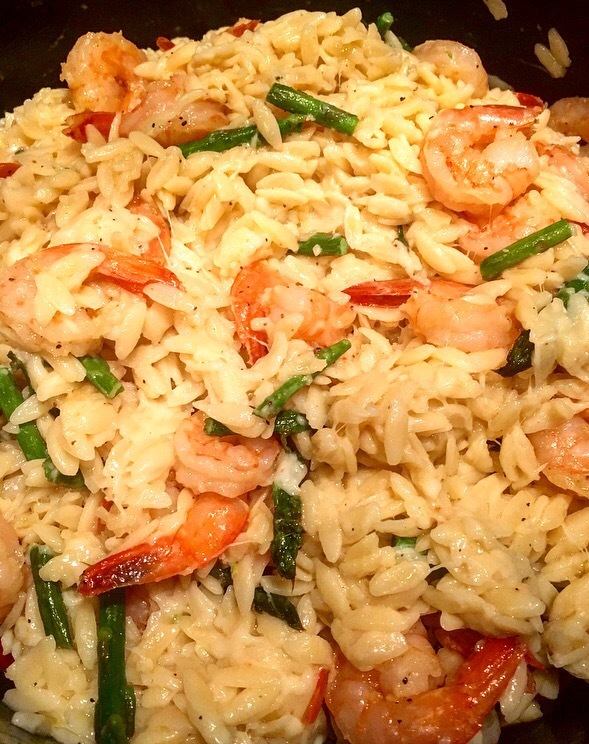 Once it melts a little, add all of your orzo. Let the orzo cook in the butter until it is fully coated for about 4 minutes on medium heat. Add your chicken stock and bring to a boil. Once it boils, put a lid on your pot and turn the heat down to as low as it goes and let cook for about 20 minutes. While your orzo cooks, begin cooking your aspragus. Add your remaining tbsp of butter in a skillet over medium high heat and add your asparagus. I like mine with a little bite so I cook for about 5 minutes. You may need to add more butter if things get dry. Season with a tsp of salt and pepper. After 5 minutes, add your minced garlic and shrimp. Let cook until your shrimp is pink (if you’re using uncooked shrimp) or for about 6 minutes if it’s already cooked. Season your asparagus and shrimp with a tsp of salt, a tsp of pepper and a tsp of onion powder. Last but not least, add your shrimp and asparagus mixture and voila! Give it a good mix and serve immediately once it’s still warm.